The product shown in the picture is a water truck produced by YTO Group Corporation, an ISO9001:2008 and ISO14001 certified watering lorry manufacturer in China. Distinct advantages of our water truck are detailed as follows. 1. Due to the electrical and pneumatic element combinational control, our water truck is simple and safe for operation. 2. It can produce high operational pressure, thus cleaning roads completely and thoroughly. 3. 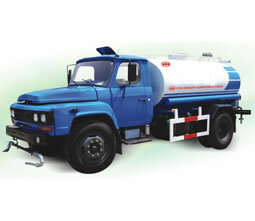 YTO water trucks are also equipped sprinkler system, so it can also be used for dust removal and air moistening. 4. They are ideal for spraying pesticides on, cleaning and irrigating ornamental trees and shrubs. In addition, they are also suitable for cleaning pavement and guardrails along the road, and can also be used as a mobile pump station and for fire fighting applications. 5. A high pressure water cannon is optional for broadening the application range of our water truck. The technical parameter of our water truck may change without prior notice. We at YTO Group Corporation can also manufacture crawler tractors, forklift trucks, concrete mixers, and road compactors, and more. If you have any need, please don't hesitate to contact us.